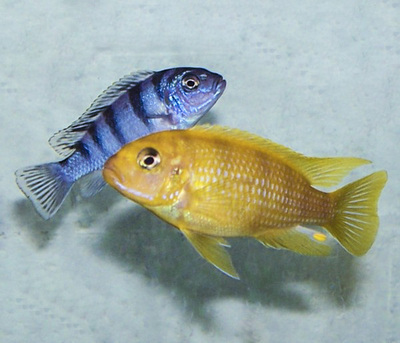 Maylandia lombardoi fish with male in front and female behind. 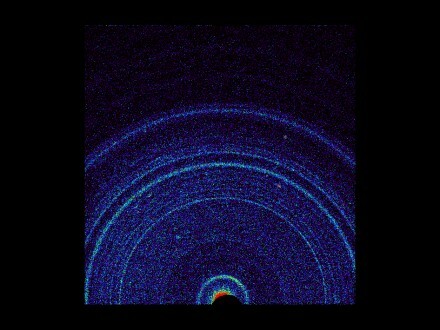 An international team of astronomers has caught a star in the act of devouring one of its planets. 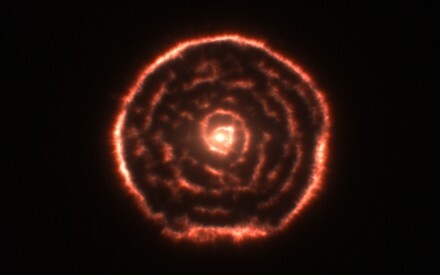 BD+48 740, a red giant they observed using the 9.2-meter Hobby-Eberly Telescope at the McDonald Observatory in Texas, appears to have the fumes of a scorched planet in its atmosphere. This is consistent with a rocky world, recently destroyed. Could the same thing happen to Earth? Yes indeed, says Alex Wolszczan, a member of the research team from Penn State University: "A similar fate may await the inner planets in our solar system when the sun becomes a red giant some five billion years from now." 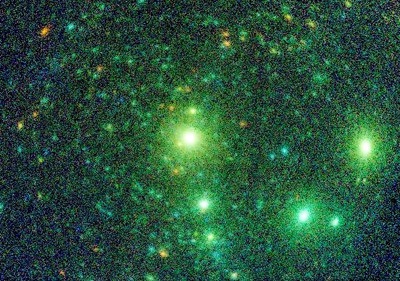 Monster galaxy lacks a bright core. 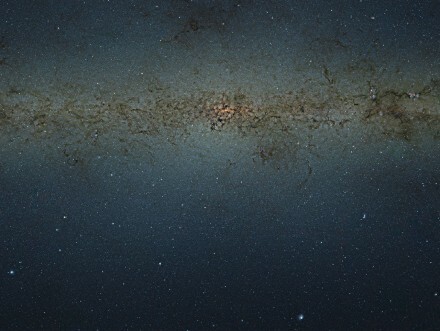 T. Lauer (National Optical Astronomy Observatory, USA), and the CLASH team. 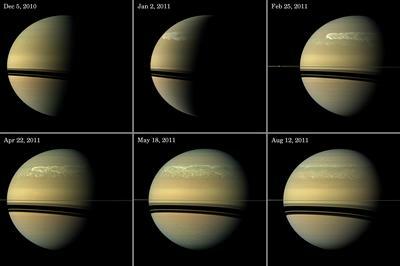 Series of images tracking the development of Saturn’s giant storm. 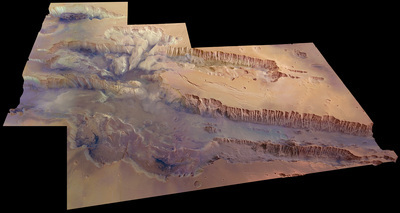 Image credits: NASA/JPL-Caltech/Space Science Institute. 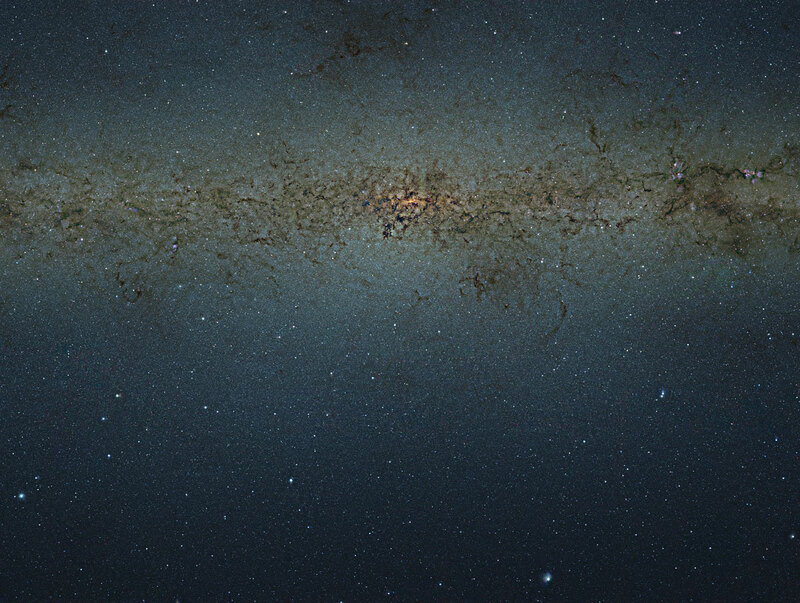 VISTA gigapixel mosaic of the central parts of the Milky Way. 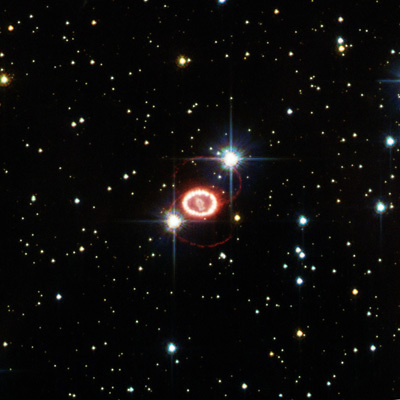 Supernova remnant SNR1987A in the Large Magellanic Cloud. Image credits: ESA/Hubble & NASA. 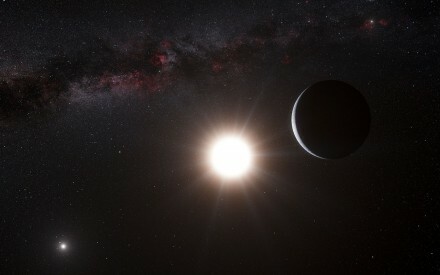 Artist’s impression of the planet around Alpha Centauri B. 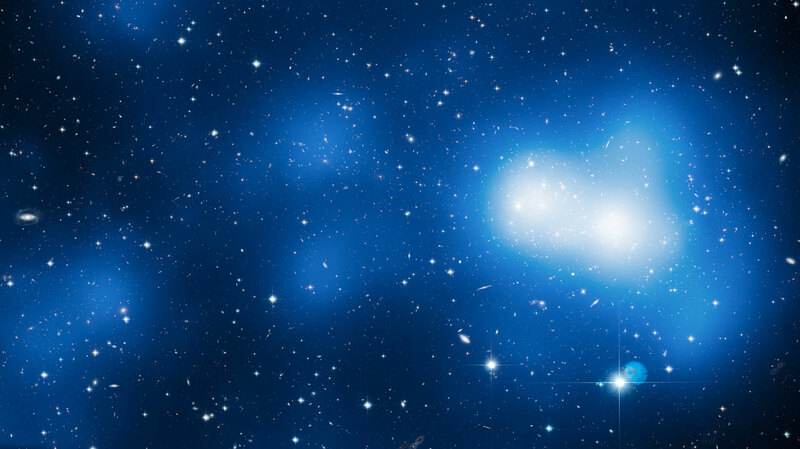 Image credits: ESO/L. Calçada/N. Risinger. 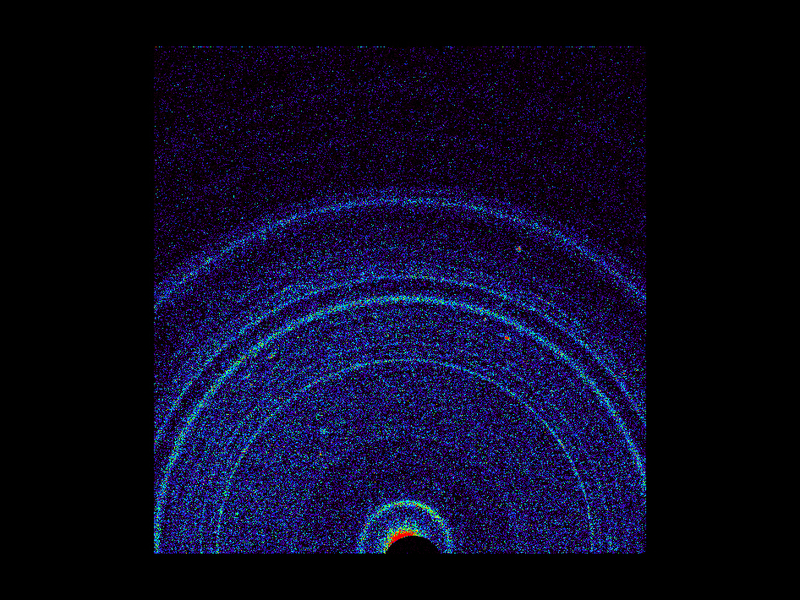 Hubble image of MACS J0717 with mass overlay. Massive star cluster Cyg OB2. 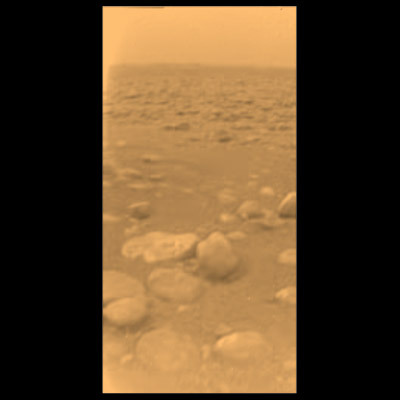 ESA's Huygens image of Titan's surface on 14 January 2005. Curious spiral spotted by ALMA around red giant star R Sculptoris. 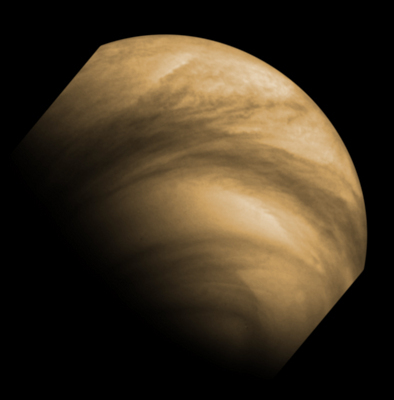 Clouds regularly punctuate Earth’s blue sky, but on Venus the clouds never part, for the planet is wrapped entirely in a 20 km-thick veil of carbon dioxide and sulphuric dioxide haze. 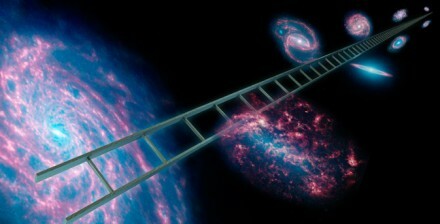 Artist's impression of the cosmic distance ladder. Astronomers using NASA's Spitzer Space Telescope have announced the most precise measurement yet of the Hubble constant, or the rate at which our universe is stretching apart. The Hubble constant is named after the astronomer Edwin P. Hubble, who astonished the world in the 1920s by confirming our universe has been expanding since it exploded into being 13.7 billion years ago. 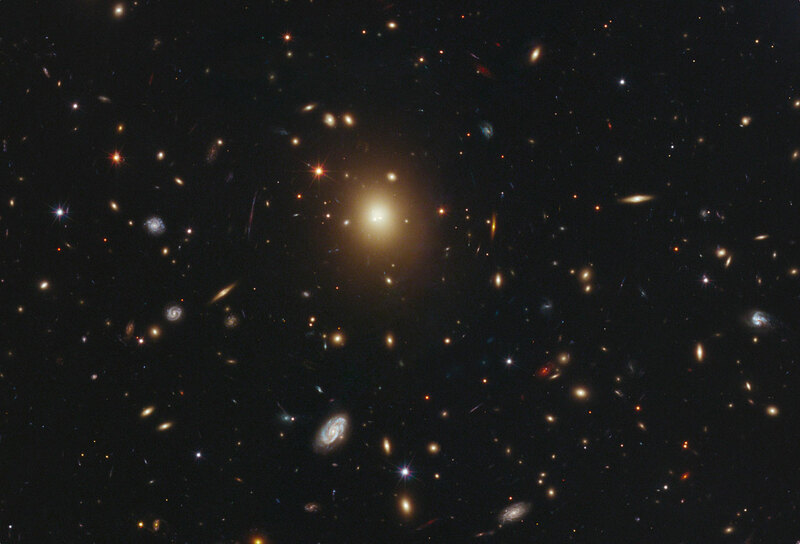 In the late 1990s, astronomers discovered the expansion is accelerating, or speeding up over time. Determining the expansion rate is critical for understanding the age and size of the universe.